I wanted something cool and leafy for June. I always think of this month, the whole month, as the beginning of summer, before it gets hot and humid, when the trees are just barely in full leaf and everything is green and the sky is blue. I’ve been waiting to use “Leaves and Shadows” as a desktop calendar since last year when “In Afternoon Sun” edged over, but I knew there would be another chance. I’m very happy to present this art this month. Here I’m trying to catch my impression of Jelly Bean on the table by Cat TV, where the leaves from the lilac flutter and the sun comes in at an angle, a little bit of leaf patterning and shadows. The scene itself is actually much darker than this but I wanted to capture the sense of light so I used the transparency of watercolor to its best ability. Bean is napping, and facing away from the window his face is in shadow while his back disappears in highlight. Sometimes it comes out pretty much as I visualized. This tiny painting was a total joy. “Leaves and Shadows” is available as a framed original sketch and a variety of digital, giclee and canvas prints, greeting card and note cards. You can find the framed painting and prints on Portraits of Animals as well. 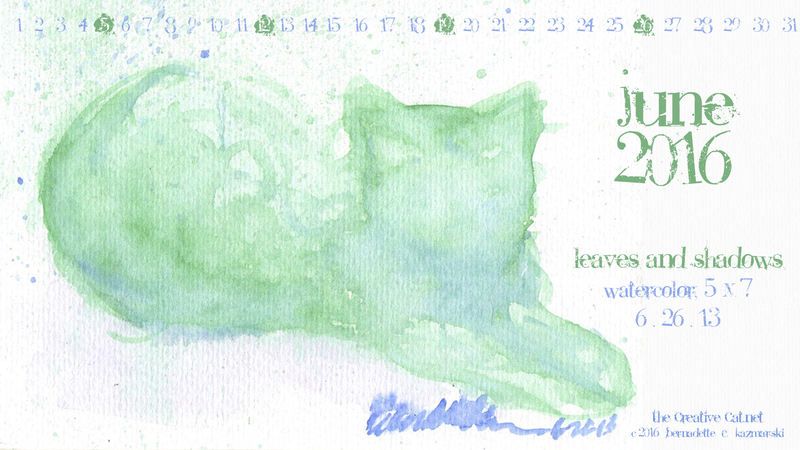 As part of this program, the monthly featured artwork and desktop calendar will always be one of the choices, so that means the current artwork, “Leaves and Shadows New Member Gift”, will only be available as one of the monthly prints until June 31. On July 1, that will be replaced with the July featured artwork. 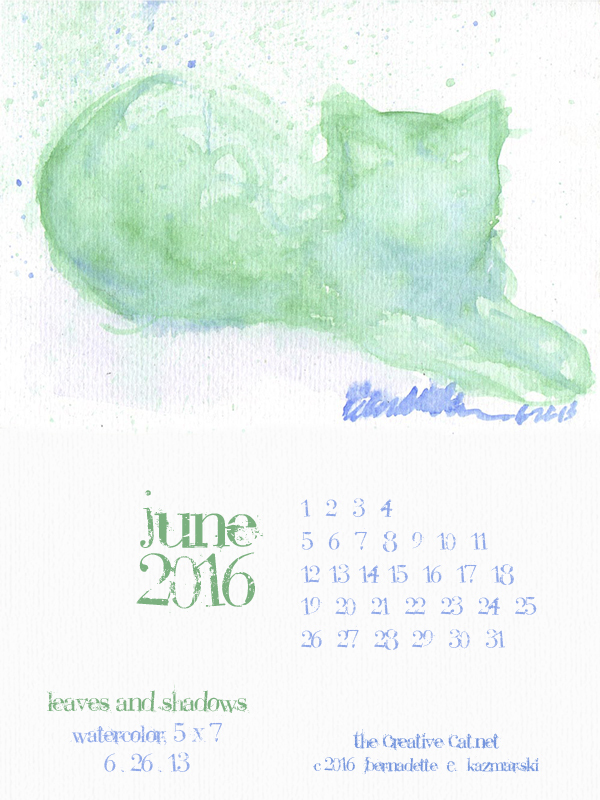 With this desktop calendar I am beginning my fifth year of presenting monthly desktop calendars with my artwork. Little did I know that when I began as an experiment with “Peaches and Peonies” in June 2012 just to see how well it went over that I’d really still be choosing at and designing a digital calendar for each month. I enjoy it now as much as I did four years ago. Thank you for using my calendars and enjoying my art! 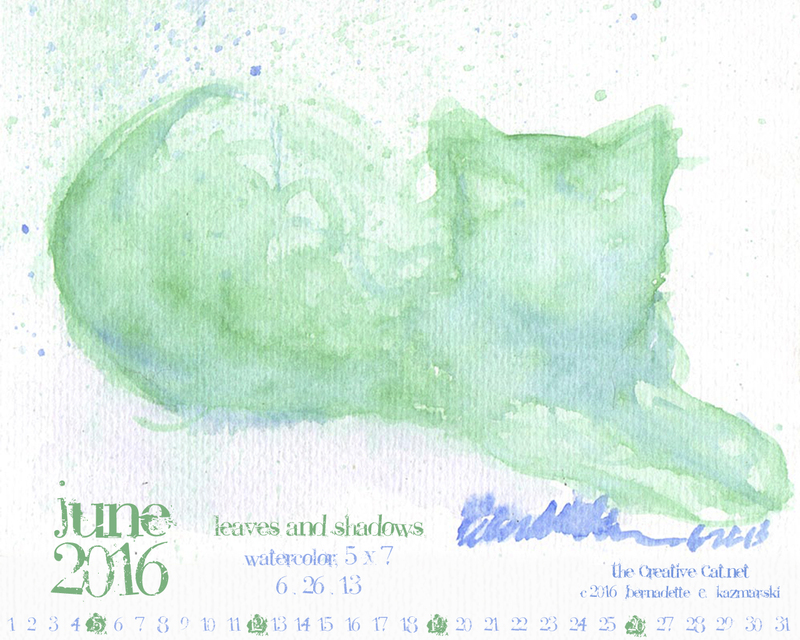 “Leaves and Shadows” desktop calendar 2560 x 1440 for HD and wide screens. “Leaves and Shadows” desktop calendar, 1280 x 1024 for square and laptop monitors. “Leaves and Shadows” desktop calendar, 600 x 800 for iPad, Kindle and other readers. 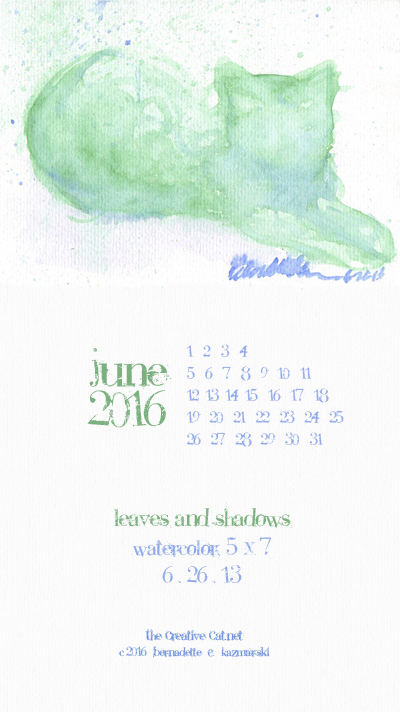 “Leaves and Shadows” desktop calendar, for 400 x 712 for mobile phones. 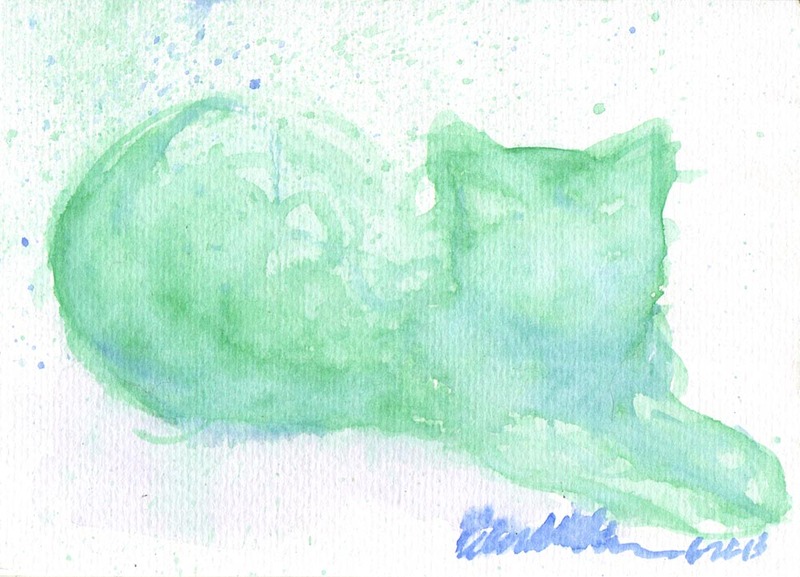 This entry was posted in animal-inspired merchandise, cat merchandise, Desktop Feline Calendar, Desktop Wallpaper Calendar, feline artwork, framed artwork, giclee print, prints of artwork, watercolor and tagged animal artwork, cat art, cat artwork, cat merchandise, cat sketches, cats, digital prints, feline artwork, watercolor on June 1, 2016 by Bernadette.